For the past 11 years, Fountains of Wayne have been a consistent soundtrack for an awful lot of the trips that generated the material for Labelscar. That’s why I’m so excited to urge everyone to run out and buy their fourth proper album (fifth if you count their 2005 B-sides comp), Traffic and Weather, when it comes out April 3. I got a chance to take a listen and I think it’s their best yet. Awhile back (a long while back), I mentioned that I wanted Labelscar to talk not only about shopping malls themselves, but also to dissect bits and pieces of associated art and pop culture. That hasn’t really happened, in large part because not much exists (and really, I missed the boat on telling you guys about “Robin Sparkles'” hilarious “Let’s Go to the Mall” video from “How I Met Your Mother”–and now I have, so if you even vaguely remember the late ’80s, go watch it). Fountains of Wayne, who are named for a Wayne, New Jersey lawn ornament store near the Willowbrook Mall, have made a career out of documenting in minute detail the lives and tribulations of the ordinary people–carpet layers, office workers, salesmen, hippie burnouts–who occupy the between spaces within the the tangled mass of freeways and suburbs that sprawl for hundreds of miles around New York City. Each song is laid out in painstaking detail, delivered with distinct East Coast cynicism, and layered over a seemingly endless array of effortlessly melodic radio-friendly soundscapes. Fountains of Wayne’s sense of place–and that place, as mentioned in one of their songs, “The Valley of Malls,”–is so keenly defined that listening to a Fountains of Wayne record is like zipping up the Garden State Parkway and flipping through every station on the dial, hearing nothing but the good stuff. Their new album is, of course, no exception. Traffic and Weather is a loosely themed concept album about travel, with song titles like “Seatbacks and Traytables,” “I-95,” and “Michael and Heather at the Baggage Claim.” Between the lovelorn Manhattan yuppies on “Someone to Love,” the drive-time TV news anchor lust of the chugging title track, or “92 Subaru,” a hard-rocking narrative of a guy who buys a beat old car with the intent of tastelessly souping it up, Fountains of Wayne again paint a set of 14 expertly written and arranged pop songs with lyrics that are humorously evocative of what much of suburbia is really like. And even better, it’ll be a great soundtrack to the summer of 2007. Does “The Valley of Malls” refer to the Passaic river valley? The band was named for a well-known fountain/statue store about a mile east of Willowbrook Mall, stuck incongruously in the middle of one of NJ’s most traveled strips of suburban shopping utopia, so it would be fitting. How did I NOT mention that detail? Geez, that was weak of me. I’ve actually made the pilgrimage to that very store before. 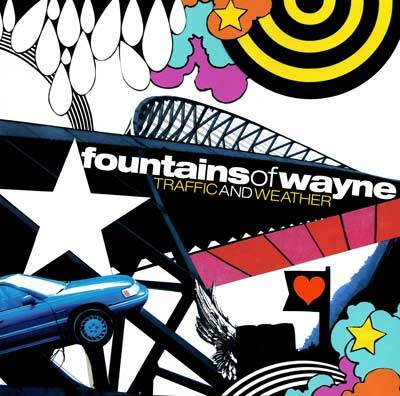 I live about two miles away from the Fountains of Wayne store. It is a very cool place, and I even bought some Christmas decorations there last year. During the Christmas season they also have what they claim is the largest animated Christmas display around. Quite frankly, the whole store is so tacky, it’s awesome. Too bad that a few stores up was the great Anthony Wayne burger joint that closed down a few years ago. They had these old wooden tables that had been around for so long you could see the generations of love notes if you will engraved in them. Fountains of Wayne is a very cool group. Of course, they are most famous for a song that most people have heard, but don’t know if was written by them. That song is That Thing You Do from the movie of the same name. And given that I used to live one town over, I am also fond of the song Hackensack. They did actually write “That Thing You Do!,” although they didn’t perform it. In fact, the vocals on the cut were done by Mike Viola, the lead singer of the Candy Butchers (another great band well worth checking out) and who also sings backing vocals on “Fire in the Canyon” on the new FOW record. At this point, it seems most people know them for “Stacy’s Mom.” I hope they can avoid becoming a one-hit-wonder, because they deserve far more.